WebWorkers have attracted the attention as one of the most important things of web development in the near future. But today, it still has some problems. Especially, developer experience is not good. How to separate code, how to communicate with it, and how to deploy it… it’s not fun. This post explains how to integrate Comlink with your Angular application that created by Angular CLI. After read it, you will be able to create WebWorker script easily and separate application codes into that. Let’s get started! All contents of this article are completely just for experiment. I don’t recommend you to adopt these in production. Enjoy! An example application is simple. Install Angular CLI if you still have it. After installation, run the command to create a new application with minimal configuration. A minimal application doesn’t has files for testing. And just hit Enter key twice. No routing, and using CSS. Then, install WorkerPlugin, which is a webpack plugin to split code for workers. And install ngx-build-plus to use WorkerPlugin in Angular CLI’s build process. It allows us extend CLI’s webpack configuration without ejection! To enable WorkerPlugin, create new webpack.extra.js file at the project root dir. At last, update the build task to load the extra configuration. There are two ways. One is via command line argument; --extraWebpackConfig . 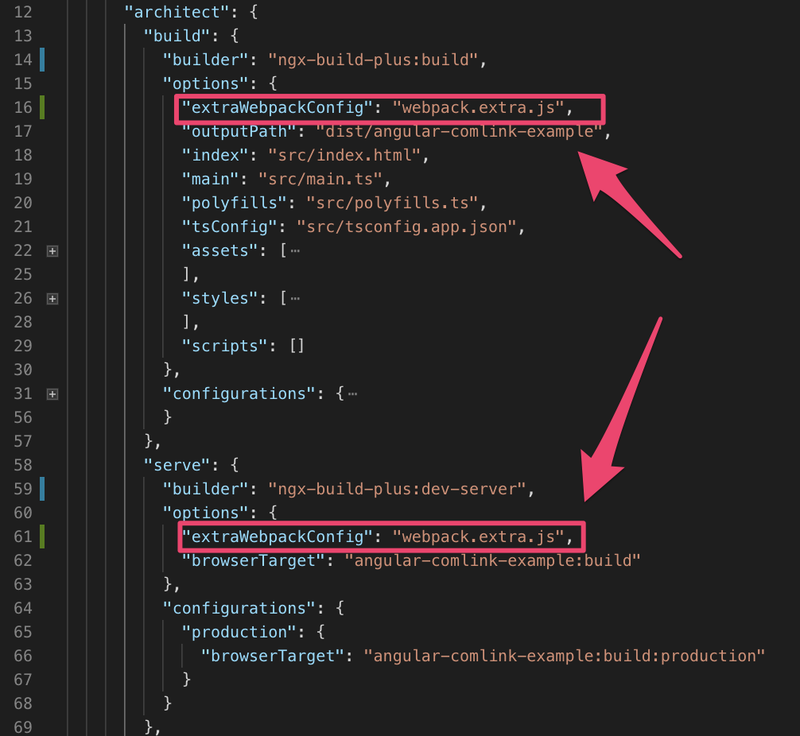 Another option is via angular.json setting; extraWebpackConfig . That’s all! Now, your Angular CLI project can build WebWorker script with code splitting. Let’s go next step. Install Comlink as the below. Comlink has its own TypeScript definition in the package, so you don’t need additional installation. For example, let’s make a markdown processor with Comlink. It can convert markdown text to HTML. At first, create a class file named markdown.ts in src/app/worker directory. To create it, ng generate command is useful. This file will be the entry point of the worker’s bundle. To handle markdown, please install marked and @types/marked. Then, implement markdown.ts as following. It’s simple code to compile markdown to HTML with marked. To expose the class to outside the worker, call expose function as the below. That’s all to implement Worker-side code. Just declare a class and expose it. Ain’t easy? Next step. Let’s call the Markdown class through Comlink. It’s not static reference, but you can take all benefits of TypeScript and WebWorker. And here is an initial implementation. The returned MarkdownWorker is a class constructor. To use its functionality, create its instance by new MarkdownWorker() . But it doesn’t return the same instance of Markdown but its promisified version. Look at the code. The construction returns Promise of the instance, so you need to await it. This is the Comlink’s interface. All from worker-side are promisified. If you use a TypeScript-friendly editor, you can find out its autocompletion can suggest worker.compile with the correct type definition. Comlink is TypeScript friendly. That is why I’m loving this. compile() has its correct type! To see the work of Comlink and WorkerPlugin, finish the application. Here is AppComponent modified to use MarkdownService and show the result. Let’s serve the app by usingng serve and open browser’s devtool. 0.worker.js is a chunk that is split by WorkerPlugin. It is loaded lazily after initial scripts are all loaded. It doesn’t block the initial rendering. Cool! You can load the worker script any time. If you call proxy in the compile method, the script will be loaded on-demand. Here is an example. TypeScript + Comlink is cool!! All sample code is public in GitHub. Any feedback is welcome. Thanks for reading! !